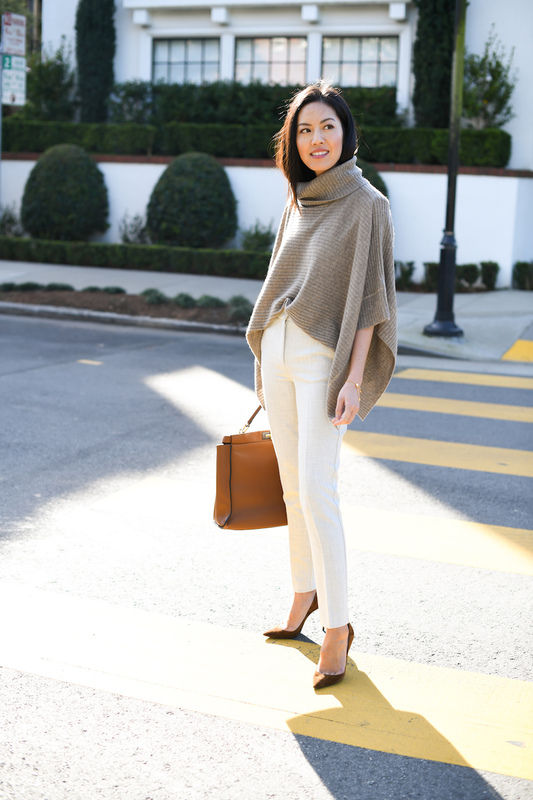 I had forgotten how unbelievably comfortable a soft cashmere poncho could be – this one is stretchy, luxe and perfectly neutral. Pairing it with a pair of trousers that have been worn dozens of times on this blog over the years… I’m planning on doing a round up of some of those outfits over the years soon! Stay tuned! I had a quick two days in Dallas (always so good to be back there!) but made it back home in time for Saturday night’s bedtime routine with Lucia. Hope you had a wonderful weekend and thanks for stopping by! Love ♥️this casual elegance poncho look! Such an elegant way to wear a poncho! That poncho is really cute ! I love how you styled it! Wooww such a great way to wear a poncho! Love the pants you’re wearing! The frabric and the fit are perfect! I never thought ponchos could be flattering, I’ve never seen anyone wearing one like that at least but you did it really well, it looks amazing and really warm and cozy as well. you make a poncho look so chic!! Can’t wait to see a round-up of all of your favorite outfits <3 🙂 In love with how cozy this poncho looks! And it's super chic the way you styled it by half-tucking it into these trousers! Love the soft hues in this outfit! Such a beautiful casual look!